Hyderabad is a historic city, and there much to do here on the weekend. But, once you’re done with them, you may want to check out what’s near Hyderabad. And, of course, you don’t want to just wander around the city – you want only to visit the best places. This is why we have put together a list of what we believe are the best 17 places to visit near Hyderabad. These places are a mixture of temples, forts, popular lakes and much more. Do check them out below. The Sri Rama Chandra Swamy Temple is a treasure trove of ancient history. Located in the Ammapalli village, the temple has always been a popular tourist spot. The main idol at the temple is believed to be more than 1000 years old and a unique feature is the Rajasthani arches that are normally found on palaces. Try and visit during the prayer service at the temple, it is a magical experience. Don’t forget to carry your camera to the temple as there are some spectacular sights. For an insight into the history of Bhuvanagiri, visit the Bhongir Fort. Inside the fort, there is lost art in the form of old carvings on the walls of the armoury and chambers of the forts. There are old moats and doors as well as a few underground chambers at the fort that were once glorified for their strength. The hike up to the fort is comfortable, there are steps, so you don’t have to stress about getting to the fort. The view from the top of the fort is splendid. It offers stunning views of the Bhuvanagiri town. The Yadagirigutta Temple is a must visit place near Hyderabad. It is historic and is the abode of Narasimha Swamy, an incarnation of Lord Vishnu. The temple lies on a hillock and was carved out of a rock. While you are at the temple, do not forget to click a picture of the Sudarshana Chakra of Lord Vishnu that is situated on top of the temple. Situated close to Hyderabad, Surendrapuri is a cultural space that is popular with tourists. Attractions here are the Nagarkoti, a 100-foot Shiva linga and giant statues of Lord Hanuman and Shiva. There’s a unique mythological theme park called Kunda Satyanarayana Kaladhamam that has a few rides and many gorgeous statues. For meals, there is a cafeteria that serves pure vegetarian food. The Ananthagiri Hills is located about an hour’s drive away from Hyderabad. It is a popular hangout spot for the people of Hyderabad who often use the weekend as an opportunity to get away from the city. Spend a day at Ananthagiri hills enjoying nature and indulging in some water sports. The majestic Medak fort is definitely worth a visit. The fort has three main entrances that are bedecked with illustrations and sculptures. Inside the fort lies an old mosque that is built in true Mughal architectural style. The highlight attraction at the fort is the 3.5-metre-long cannon, etched with a trident. 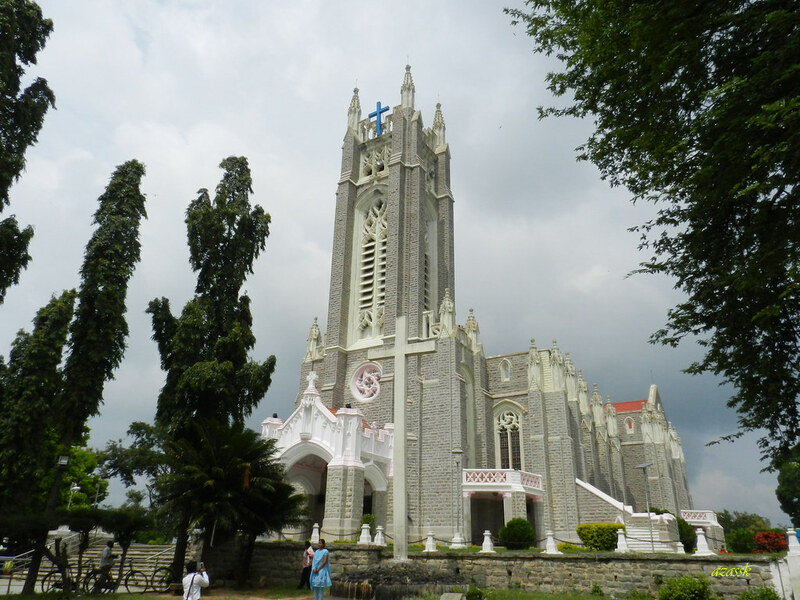 The Medak Cathedral is one of the biggest churches in India. It is worth a visit for those who love architecture and peaceful places. Inside the church, the highlight attraction is the striking stain glass painting at the back of the altar. The best time to visit the church is during the festivals of Christmas and Easter. At Christmas, the beautifully décor and lights add a festive ambience. The Chaya Someswara Swamy is a stunning 11th century AD temple. The Chaya Someswara Swamy Temple is located in the historic town of Pangal. Inside the temple, you will see the stunning structures of Hindu gods that date back to the 1st century AD. The temple’s pillars are adorned with sculptures of scenes from the Mahabharata and Ramayana. Visit this temple to relive the gorgeous architecture of the Kunduru Cholas. The Bidar is a testament to the might South Indian kingdoms of yore. The fort still has its moats intact and features stunning carvings and inscriptions. In the fort premises, there is a museum that takes you back in time with the artefacts it holds. For the best experience, hire a guide. You will have to negotiate a price with the guide, the average price is Rs. 200. Make sure that your guide has a valid ID card, there are many touts pretending to guide crawling around the fort. The Thousand Pillar Temple in Warangal was constructed by the great Rudra Deva of the Kakatiya dynasty. The temple is known for its majestic thousand pillars that are neatly tucked together and star shape. In the temple premises, there is a huge structure of a Nandi cut from basalt rock and statues of Vishnu and Surya, two Hindu gods. The Warangal Fort is a historic fort in Telangana. It is believed to have been built during the Kakatiya dynasty. The main attractions at the fort are the four ornamental gates that is also the emblem for the Telangana state. Although the fort lied in ruins, many people still visit to catch a glimpse of this stunning architecture. The Kakatiya Musical Garden lays claim to a beautiful water fountain that is a star attraction around the Bhadrakali temple. There is a manmade lake near the fountain that is excellent for leisure. Musical fountain shows begin at 7 pm. To get to the temple, you have to pass through a road that is surrounded by tall trees. The Ramappa Temple is well known for its garbhagriha, an antarala, and a maha mandapam. The walls of the temple are beautifully adorned with carvings of animals. In the temple complex, there is a stone Nandi bull and a replica of Lord Shiva’s vehicle. 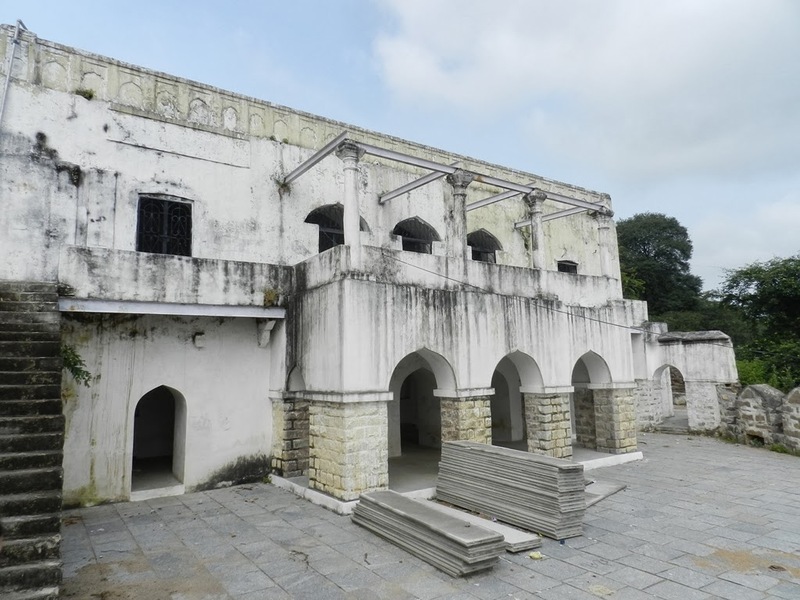 Blessed with rich history, Khush Mahal stands tall near the Warangal Fort. Built during the 14th century, this palace basks in Tughlak architectural glory. In the mahal are high ceilings and beautiful artwork on the walls. An architectural treat, you will love exploring the rich artwork inside Khush Mahal. A towering structure, the Bahamani Tombs are a series of 12 tombs. They are a prime example of Indo-Islamic art and the walls of the tombs feature texts in Arabic text. A noteworthy site here is the tomb of Ahmad Shah-Al-Wali that is decorated with gold Arabic text. The Nagarjunasagar Wildlife Sanctuary is the perfect place to visit if you are looking to explore wildlife. Recently converted into a tiger reserve, the sanctuary houses exotic animals such as the Bengal tiger and the monitor lizard. The best way to explore this wildlife sanctuary is by booking a safari tour. The one and a half hour safari cost Rs. 800. The first safari ride begins at 9 am. After you have visited Nagarjunsagar, drive down to Macherla that is located close by. At this culturally rich town, there a few historic sites near the city centre that are worth visiting. On your way back to Hyderabad from Macherla, stop by at the Ethipothala Falls. The next time you are in Hyderabad or a planning on making a trip here, add these places to your journey. They are not only rooted in history by are closely connected to Andhra’s rich heritage and culture.